Get ready to inhale about 70 boysenberry choc-tops, guys. It’s a big weekend for movies in Melbourne. The Astor is kicking off their Nicholas Cage-a-Thon, The Lido is screening Bambi if you want to ball your eyes out, and Tom Cruise reminds everyone that 70 year-olds can still do their own stunts. Don’t forget MIFF is on as well (this year’s program is the biggest ever). Here’s everything worth watching this weekend in Melbourne. Two words: Nicholas Cage. The Astor is launching it’s 12-hour Cage-a-Thon tonight at 9:30pm, which’ll run all the way into tomorrow morning. Expect Mandy, Raising Arizona (yessss), Vampire’s Kiss (less yes...) and Con Air, among others, all decked out in glorious 35mm print. The only one missing is The Rock. C’mon Astor, no Connery? Full program here. Melbourne’s new northside cinema is mixing it up this weekend. You’ve got Incredibles 2 sitting alongside Mean Streets and Desperately Seeking Susan. Should be a little something for everyone. Personally, we’re hanging out for Don’t Look Back on Saturday arvo. Don’t forget a hipster choc-top, courtesy of Preston’s Ice Cream Embassy. Full program here. The Lido Rooftop may be closed, but they’re still screening a bunch of good stuff. This weekend it’s Cédric Klapisch’s heart-wrencher, Back To Burgundy, plus Bambi and Dumbo if you want a solid nostalgia hit (and talk about heart-wrenching...). Brother’s Nest with Shane Jacobson (and his bro Clayton) looks interesting too. We’ll see you at Vaporetto afterwards, yeah? Full program here. Nova is looking pretty stacked this weekend. It’s one of the only places in town screening Best F(r)riends (a reunion of The Room’s cult icons, Tommy Wiseau and Greg Sestero). There’s also Breath on tonight, based on Tim Winton’s classic novel and starring The Mentalist himself, Simon Baker. Rocking a pretty decent beard, if you ask us. Full program here. 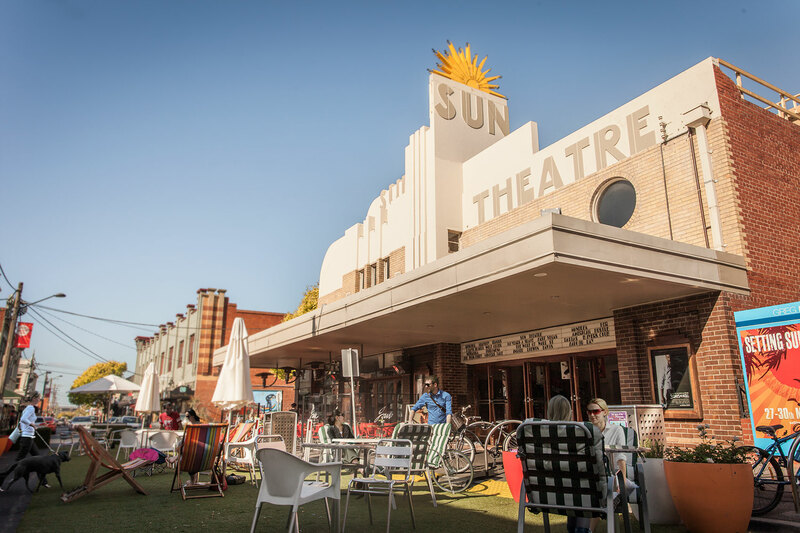 Sun Theatre over in Yarraville is easily our favourite cinema in the West, and the program’s looking pretty sweet. Next Wednesday they’re screening Kubrick’s 2001: A Space Odyssey and there’s a Marvel movie marathon running from 25 Aug – 15 Sep. Full program here. If you haven’t caught Jurassic World: Fallen Kingdom yet, Coburg Drive-in is screening it on Friday, Saturday and Sunday. They’re also rocking The Equalizer 2, which will take a lot to live up to the corkscrew-bloody mayhem of the original (who knew Denzel was such a badass? Everybody, that’s who.) Full program here. Need more? Here's our list of Melbourne's best cinemas. Go nuts.